(RALEIGH, NC) – Once again, Travis Scott takes it up a notch - or ten. Known for his explosively wild performances, the history-making Houston superstar will launch his biggest tour yet this fall: "ASTROWORLD: WISH YOU WERE HERE." Bringing the amusement park of his chart-dominating critically acclaimed blockbuster “ASTROWORLD” to life on stage, the artist has envisioned a show unlike anything done before and unlikely to be topped. 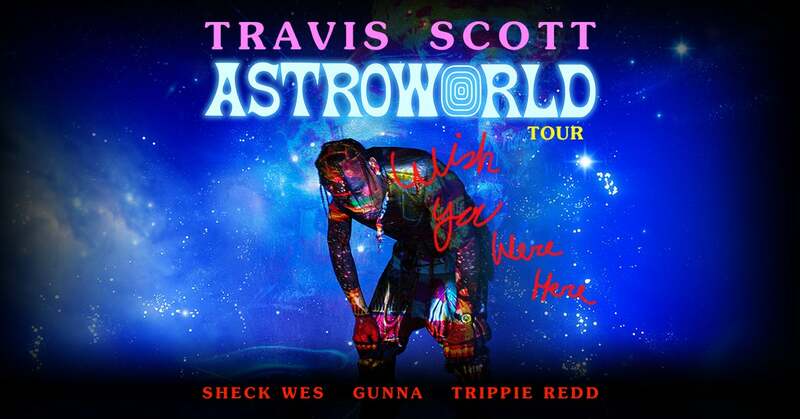 Produced by Live Nation, the tour kicks off Thursday, Nov. 8, 2018 at Royal Farms Arena in Baltimore, MD, Friday, Nov. 9 at PNC Arena in Raleigh, returns to Houston for the inaugural ASTROWORLD FESTIVAL November 17, and rolls through historic venues like Madison Square Garden November 27, before concluding just before Christmas at The Forum in Los Angeles, CA. The official fan presale goes live HERE on Wednesday, Aug. 22 at 4 p.m. American Express® Card Members can purchase tickets before the general public beginning Tuesday, Aug. 21 at 10 a.m. through Thursday, Aug. 23 at 10 p.m. General on-sale begins August 24 HERE. His live shows have become the stuff of a legend with Billboard writing, "Travis Scott's penchant for raging, off-the-wall live shows have become an essential part of his career." Next up, he brings that performance to the MTV VMAs on Monday, Aug. 20. Celebrating the success of “ASTROWORLD,” Travis consistently uses his platform to give back, transferring his blessings to others. He recently gifted a fan $800 to help pay for his mother's funeral costs. See the story on People. He further shared the wealth, handing out $100,000 on Cash App. Additionally, “ASTROWORLD” retains its spot at #1 on the Billboard Top 200 for a second week in a row. It's just the beginning. Like the wildest rollercoaster imaginable, Missouri City, Texas-born and Los Angeles-based multiplatinum artist Travis Scott flips popular music, culture, and fashion upside down. His third full-length album, “ASTROWORLD” [Cactus Jack Records/Epic Records], opened up as the undisputed, undeniable, and ultimate musical attraction of 2018. Upon arrival, it catapulted to #1 on the Billboard Top 200, earned the "second highest debut of the year," and raised the bar by achieving the "biggest ever first-week streaming total for Sony Music" with 349.43 million streams worldwide in under seven days. Not to mention, it emerged as "the best Epic Records debut since 1999" with total sales of 537,000-270,000 comprised of traditional sales. This notably marked the highest pure sales week of the year as well. Acclaimed by Pitchfork, Entertainment Weekly, Rolling Stone, and more and gracing the cover of GQ, this takeover paved the way for his second MTV VMA performance, “ASTROWORLD” Festival in Houston, and the gargantuan "ASTROWORLD: WISH YOU WERE HERE TOUR" in 2018 and 2019.